Eldon “Spike” James played both high school and Junior A hockey in Ottawa before enrolling at Michigan. He played goal for three years under Coach Eddie Lowrey. He was elected captain during his senior year. During the 1937-1938, he had a 13-6 record with two shutouts. For the 1938-1939 season, he went 8-8-2 with one shutout. 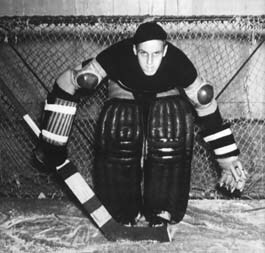 During the 1939-1940 season, he played twenty games where he had five wins, including two shutouts. His most memorable game was in 1940 against Minnesota when he had fifty-one saves in a 5-0 loss. Spike James was twice elected to the Midwest College All-Star team, in 1937-1938 and 1939-1940. He graduated from the College of Literature, Science, and the Arts in 1940. After college, he played two seasons in Winnipeg and coached two years in Buffalo.